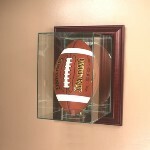 Football acrylic case with with mirror back, ball stand and wood base trim choice. protection of your memorabilia collection. Price includes 1 free nameplate. Don't need a complete display case? 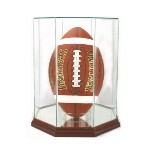 Rectangle shape football display stand featuring a wood base choice. You get your choice of walnut, cherry, oak or black finishes. Dimensions are 12"L x 8"W x 2-1/2"H without the ball. Desktop football glass case with a wood base. Holds 1 full size football. Features UV protection, a mirrored floor and custom pylon ball stand. Comes with 1 free nameplate. 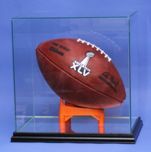 Interior dimensions are 12"L x 8 3/4"W x 8"H.
Football hexagon shape glass display case featuring an all clear UV protected glass top and cherry wood base trim. The floor is mirrored so you can see the entire ball. Includes 1 free nampelate. dimensions are 12 x 9 x 8. Our unique hinged design allows for easy access. Mounting hardware is included. 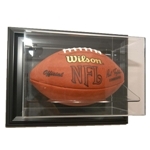 Wall mount football glass display case featuring a mirrored back panel and furniture grade wood frame and real UV protected glass. Interior dimensions are 12 x 9 x 8. Our unique hinged design allows for easy access. mirrored so you can see the entire ball. The ball sits on our exclusive custom made stand to hold the ball up off the floor. traditional metal nameplate/plaque please see Item Code:FOOTBALL-201-W. Interior dimensions are 13"L x 8 3/4"W x 8"H.
PLEASE ALLOW 2-3 WEEKS MINUMUM FOR DELIVERY. a mirrored back panel and furniture grade wood base and real UV protected glass. The base is mirrored so you can see the entire ball. The ball sits on a custom made stand that holds the ball up off the floor. are available. Interior dimensions are 12"L x 8 3/4"W x 8"H.
and furniture grade wood base and real UV protected glass. The base is mirrored so you can see the entire ball. are 12"L x 8 3/4"W x 8"H. The text that you type into the engraving fields will be laser etched directly onto the glass. different location, or if you would like additional panels etched or a traditional engraved nameplate - plaque, please call or email us. The base is morrored so you can see the entire ball. The ball sits on a custom made stand that holds the ball up off the floor. so you can see the entire ball. 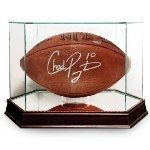 please see Item Code:FOOTBALL-202.Inside dimensions: 12 x 12 x 11. Inside dimensions: 12 x 8 x 11.
you can see the entire ball. Includes 1 free nameplate. Additional nameplates are available. 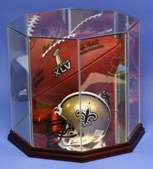 Case is approx 8"L x 8"W x 13"H.
Vertical football octagon shape display case featuring 3 mirrored back panels and a furniture grade wood base and real UV protected glass. The base is mirrored so you can see the entire ball. Case is approx 8"L x 8"W x 13"H.
are 8 x 9 x 12. Our unique hinged design allows for easy access. Mounting hardware is included. 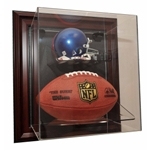 Wall mount vertical football glass display case featuring a furniture grade wood frame, mirrored back and real UV protected glass. Inside measurements are 8 x 9 x 12. Our unique hinged design allows for easy access. Mounting hardware is included. 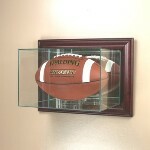 Our wall mount football acrylic display case is beautifully designed and constructed. 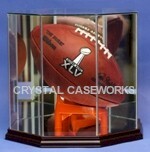 Our tabletop football acrylic display case is beautifully designed and constructed. ball stand. A large glossy wood base and black velvet base interior creates a stunning contrast for the item you’re displaying. is shipped flat and minor assembly is required. Price includes 1 free nameplate. If no nameplate is wanted, simply leave that field blank.